PARIS BORDON AND CIMA DA CONEGLIANO HARMONISE THE DIFFERENCES IN PROSECCO Visit to Treviso, Paris Bordone’s hometown: here Prosecco is DOC. Treviso was known as Urbs Picta. And this is how the old city centre inside the sixteenth-century walls looks today. Almost all the houses have a portico, acute Gothic arches alternating with the low, round ones of the sixteenth-century homes. Paris Bordon, a Renaissance painter of the Veneto school, is linked to this city. And for this reason we will go to Biancade and visit the church to see the altarpiece over the altar that he painted in around 1531. After having tasted various Prosecco DOC wines in a winery, we will set out for Conegliano and a lunch featuring typical local products. The aim of this tour is to explain the difference between the two vine and wine businesses represented by the diversity of the landscape and also by the wine produced here. We will end in the splendid hills of Felettano, explaining this area’s ancient crafts through the frescoes in an old church. The tour starts at 10.00 am in the old centre of Treviso, a frescoed city with a great medieval history that however enjoyed maximum splendour during the Italian Renaissance, linked also to Venice (the two cities are about 30 km apart). The tour ends at approximately 7.00 pm. For those wanting to book accommodation locally, either before or after the tour, there are 4-star hotels and B&Bs in the hills. Those arriving from Venice can use the transfer service we provide. The tour can be organised using a minibus for a maximum of 8 people or in larger buses for a minimum of 14 and a maximum of 18 people. The tour is not recommended for families with small children or for those with serious disabilities. We suggest casual clothing and comfortable shoes. 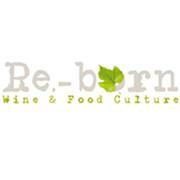 Re-Born is a product of excellence based on the culture of elegance and excellent food. We blend the knowledge and experience of our founding partners, who created this product with the primary goal of selecting and offering the best of the Veneto region's produce, especially in wines. This showcasing of the typical products of the Prosecco zone stems from the culture of food and wine that Re-Born wants to promote as its philosophy studying and the artistic points of interest.